The radiator in your car works to keep the engine cool, preventing a host of issues that could result in engine failure. The radiator works in conjunction with your entire cooling system — fans, hoses, coolant, etc. If you need a new radiator, or if you need your current radiator repaired, visit our auto repair shop located in North Raleigh. As part of our premier auto maintenance and repair work services, TransMedics’ mechanics specialize in radiators. Come see us for the best in radiator service and support in Raleigh — no appointment necessary! Overheating – Overheating, even in mild temperatures, is usually a key sign of impending radiator trouble. You can tell if your car is overheating by taking a look at the temperature gauge located on the dashboard. It’s usually near the fuel gauge. Cars that are overheating should be pulled over and shut off immediately. Leaky Fluid – A fluid leak could mean something simple like a bad cap or hose — it could also be indicative of a busted radiator. The liquid that pools under your car when stopped is coolant, and a radiator without coolant is useless. Thermostat Changes Between Hot & Cold Air – If you’ve ever been driving on a hot summer day while blasting the air conditioning and felt warm air come through the vents and into your cabin, you could be experiencing a radiator issue. Temperature can fluctuate — if you can’t get comfortable, bring your car to TransMedics! Radiator Hoses, Fans, Coolant — Our Raleigh Auto Shop Does It All! The cooling system in your car is absolutely crucial to your car’s performance. Don’t entrust it to anyone but a professional! 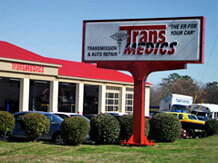 Contact or visit TransMedics today for radiator service. Our shop is located near the corner of Millbrook Road and Old Wake Forest Road. We can’t wait to see you!